Merry Christmas all. I hope you all are having a great time with your families. Another year has gone by and another will soon pass. Enjoy your Holidays and be safe. To start off. The name Crytonic and anything i have is nothing but a handle name. 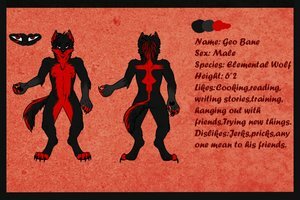 Geo Bane is my fursona. I got it from a couple of friends who say i'm connected to the earth as a natural element. Geo meaning earth and Bane meaning fatal injury or deadly poison. I'm a writer and i'm a male. Any other questions just ask. I don't bite. Thank you for being a reader! So good to find more! But seriously, watch out for the gore; I post more here than anywhere else. Thank you for the watch! I just hope you know what you're getting yourself into!